The following is a guest post by Jonah Lopin (@jonahlopin), founder at Crayon. Jonah is a HubSpot alumnus, and I'm an angel investor in the company. Here at Crayon, we love humans. In fact, all our moms and many of our best friends are humans! But when it comes to solving problems, we prefer code. Humans are awesome at certain things, like closing enterprise sales deals, delivering rousing speeches, and comforting small children. For these tasks and lots of others, humans are far superior to code. For a product-driven software company, there’s something else to consider. It’s subtle, but important. Software is better than humans at providing an elegant solution to complex problems at scale. Tomasz from Redpoint put together some fascinating data back in 2012 that showed billion dollar public SaaS companies have revenue per employee around 200k/year. Jeremiah Owyang puts revenue per employee at Google & Facebook around $1m per employee, about 5x higher! 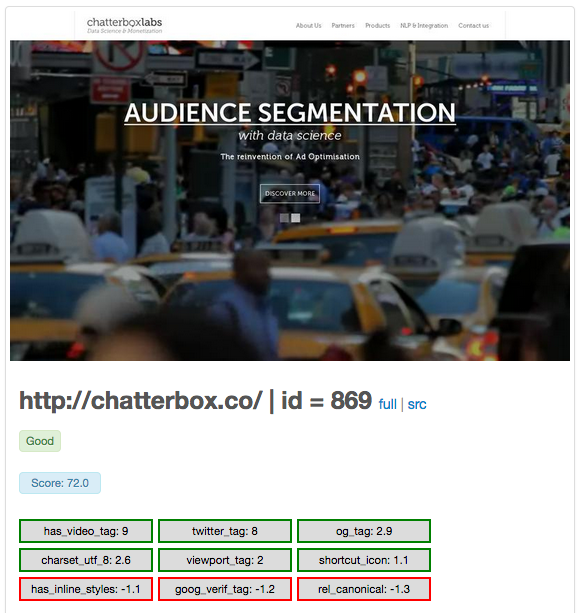 Clearly, Facebook & Google solve more problems with code than a typical B2B software company. The fact that Google & Facebook solve their primary problems with code rather than people doesn’t just impact their metrics and margins, it shapes the elegance and efficiency of the solutions they provide. The subtle advantage of solving problems with code rather than humans is that it tends to make your core product better over time. The rest of this post is about a big problem we had and how we solved it with code. Crayon is a visual inspiration platform. We help marketers get great ideas so they can do better marketing. We’re programmatically adding about half a million pages to our system every day. As I write this article, we’ve got about 13 million designs in the system, and we’ll have close to 100 million by the end of the year. We let users vote designs up and down, so most categories on Crayon like Startup Home Pages, B2B Pricing Pages and Landing Pages have always looked pretty good. But we still had a problem in deeper categories: folks would be happily browsing, only to have the smooth inspirational vibe unceremoniously broken by a crappy looking page. 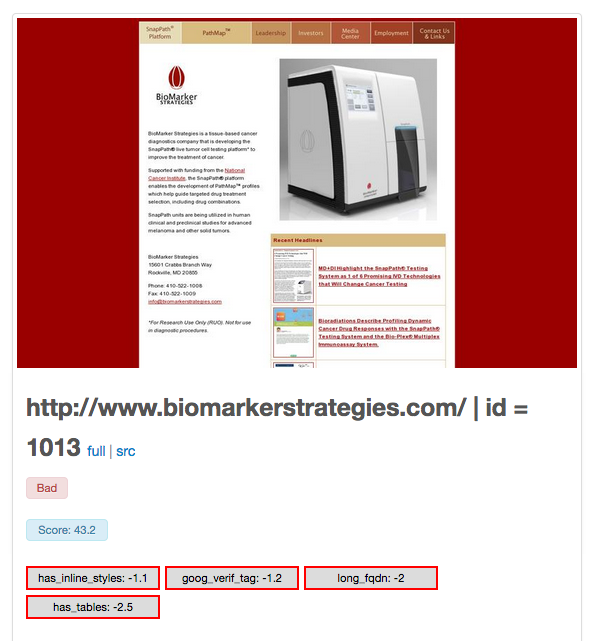 How could we get the “best” designs to the top of the result set and the “least inspiring” designs to the bottom? Can code separate “inspiring” marketing designs from “crappy” ones? Many said it couldn’t be done… but if they were right, would I be writing this article? We picked a set of 200 “inspiring” marketing designs and a set of 200 “uninteresting” marketing designs. Yes, this is a bit of a fuzzy thing to do because it’s based on human judgment. But after running the services team at HubSpot for 5.5 years, and working closely with more than 8,000 professional marketers, I felt qualified to judge which marketing designs were likely to be interesting and instructive to other marketers. So sue me! This part is like picking a basketball team without being able to watch the candidates play basketball. What characteristics of the players would you look at? For instance, you might pick taller players or players wearing high-tops. We wrote some code to test each “guess” from step 2 against each design in the training sets from step 1. We were hoping to find things that were “true” for the “inspiring” pages, and “untrue” for the “uninteresting pages”. 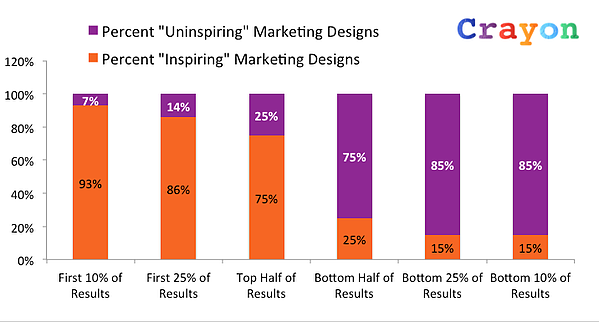 We looked at 45 discrete “guesses”, and found 25 of them were predictive of “inspiring” marketing designs. Success! Note that these factors don’t directly predict which pages are “inspiring”. Rather, these factors indicate that someone clueful created the page, which is directly predictive of a page being “inspiring”. The final step was some mathematical mojo based on how strong the signals were in step 2 to come up with an overall “inspiringness score” for each page. The top 10% of Crayon search results just went from 50% “inspiring” to a whopping 93%! We have 13 million designs in the system today, and reviewing those manually would take a 10 person team about 5 years. Ouch! But we’ll have 100 million designs by the end of the year, and that’s just the beginning. If we didn’t solve this problem with code, we’d be in serious trouble. And no humans were involved… except for the one human writing this article. Does your business have a tough problem you plan to solve with code rather than humans? Have you used machine learning to deliver elegant solutions to customers at scale? Please continue the converstaion in the comments.